An article by Mark Brown, Arts correspondent, on theguardian.com - World's earliest figural tattoos discovered on Gebelein mummies - reports on the newly discovered marks that push back evidence for tattooing in Africa by a millennium. 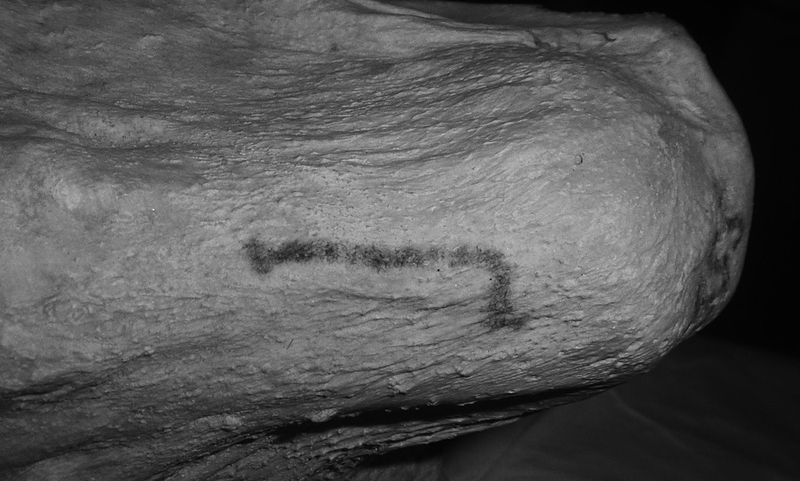 A tattoo discovered on Gebelein Woman, a 5,000-year-old mummy in the British Museum's collection. Image: British Museum. A wild bull, a Barbary sheep and S-shaped motifs discovered on two mummies in the British Museum have been revealed as the world's earliest known figural tattoos. Daniel Antoine, the curator of physical anthropology at the British Museum claims that the discoveries on two naturally mummified bodies, dating from between 3351 and 3017BC, will force a reassessment of the history of tattooing, pushing back the evidence for tattooing in Africa by a millennium. Bull tattoo. Image: British Museum. The findings, published in the Journal of Archaeological Science, concern a mummified man and woman from Egypt's predynastic period, the era before the country's unification by the first pharaoh in 3100BC. The male mummy, known as Gebelein Man A, is one of the best-preserved mummies in the world. What had not been examined previously were some indistinct dark smudges on his upper right arm that have now been revealed as tattoos of a bull and of a sheep. They may have been worn as symbols of power and strength. Before the discovery, archaeologists had thought tattoos were restricted to women. The S motif on the woman's shoulder. Image: The British Museum. 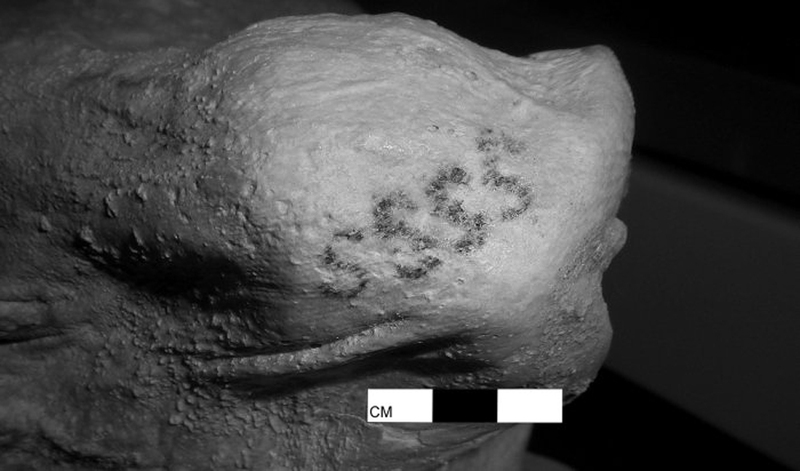 On the female mummy, known as Gebelein Woman, researchers found a series of four small S-shaped motifs. These symbols have not yet been interpreted with any certainty. Tattoos were a part of many ancient cultures. Before the latest discoveries, the oldest surviving examples were mainly geometric tattoos on an Alpine mummy known as Ötzi the Iceman, who dates from the fourth millennium BC - approximately contemporary.